“Thriving with Dyslexia” caught my eye as I browsed through The Carroll School brochure. That little phrase speaks of my desire for my children! Doesn’t it speak for all of us who care about someone with dyslexia, or any other difficulty for that matter? It says: unleash the potential, enable a child to achieve their best and let them flourish in learning. My browsing and our tour today of The Carroll Lower School for grades 1 through 5 with my husband and our daughter were not for her potential admission to the school but returning as an alum. We had come to look at the brand new Lower School campus that opened in September 2010. 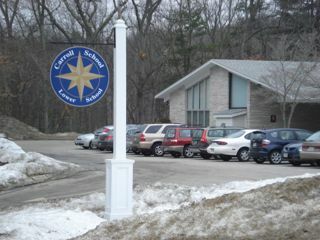 The familiar Carroll logo on the sign in front of the school clearly beckoned us. We passed a new play structure and tall stone sculpture beside the path as we came to the main doors. 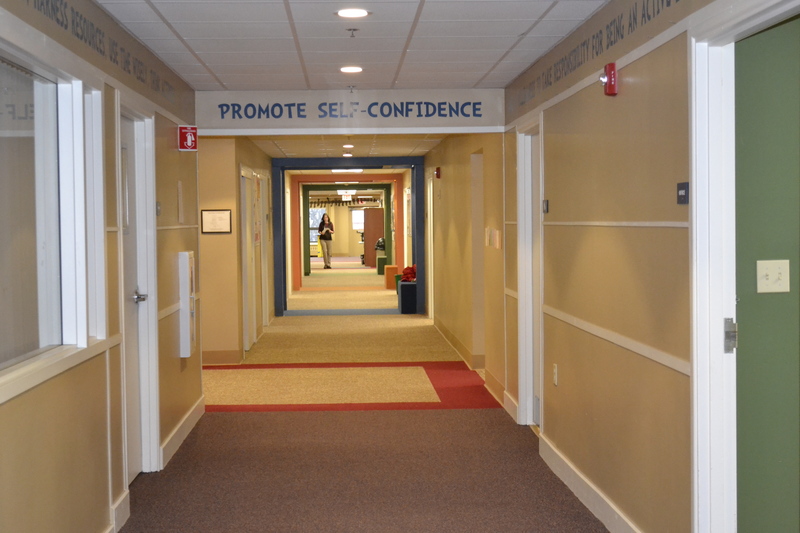 Artwork adorned the walls in the main entrance and words such as “self-confidence, healthy in self-concept, happy and reflective” were scribed around the top of the walls near the ceiling. Stretching to our right and left were long corridors in mute colors broken by archways painted in mellow blue, green or orange. We passed through the archways as we peeked in on classrooms, spied teacher and students clustered around an interactive smart board and entered larger common areas, some filled with computers, others with mats for yoga and one area, where we finished our tour, dotted with tables and chairs and shelves filled with books. We sat and talked with some faculty. We discussed where our two Carroll graduates were now in their education. My daughter was listened to as she spoke about the support she currently needed but also her desire to learn and be challenged, just like a regular kid, in in history and science and other subjects. We talked too about brains – research in neuroscience, advances being made in cognitive development and its impact for those with dyslexia. But these matters will have to wait for future posts!